The annual North American Rewilding Conference is an Open Space conference. It is a think tank of some of the continent’s most inspiring rewilders and rewilding projects, as well as a social networking opportunity for rewilders. 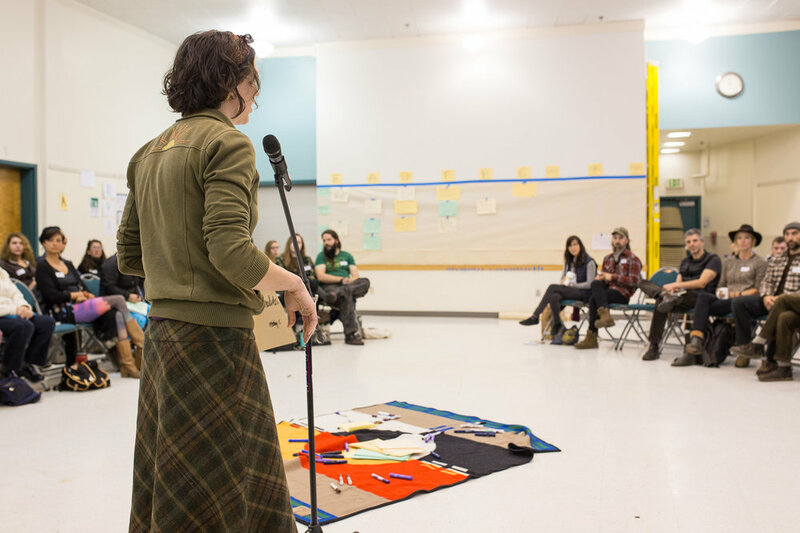 Here you will find individuals and grassroots organizations collaborating on a range of rewilding-related fields including ancestral technology, decolonization, wildlands restoration, ethnobiology, reintroduction of species, social and environmental justice, traditional ecological knowledge, and much more. This event is brought to you by Rewild Portland, a nonprofit organization serving the Portland area and the rural and wild areas beyond. Proceeds from this event go to supporting Rewild Portland's mission to promote cultural and environmental resilience. The word conference comes from the Latin root conferre, meaning “to bring together.” The focal point of a conference is to bring people together. We begin the conference by playing a social networking game. This serves the purpose of igniting the connections and dialogue that our conference is known for. After our lightning talks, our keynote speaker will give his presentation. 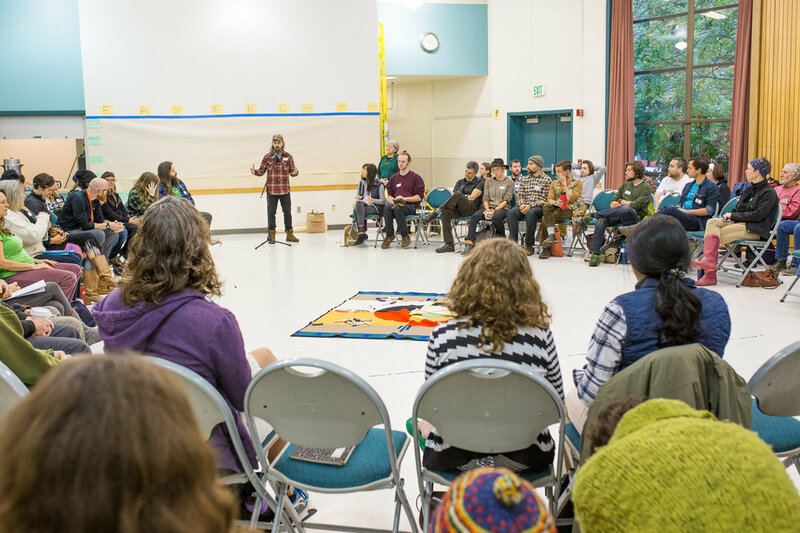 At its core, the North American Rewilding Conference is an Open Space conference. Open Space Technology is a non-hierarchical, organic, social collaboration tool best used to discuss and create solutions to a specific problem or issue. We have chosen to use Open Space Technology because it is a way of rewilding a conference. This conference does not operate the way we think of traditional conferences, with presenters or speakers giving lectures or teaching classes. Rather than having a few people talk at you, Open Space allows us to generate discussions between everyone in the field of rewilding, from institutional to grassroots, from "experts" to hobbyists. All participants arrive in the morning on the first day, create the topics, and lead the discussions. You can take part in whatever discussions you want. One of the most amazing things about Open Space is that it puts the known experts on the same field as the unknowns and laypeople. Everyone has things to contribute in a community, and Open Space is a way of pulling ideas out of the zeitgeist of the movement rather than expecting to hear solutions from just a few "thinkers." In an Open Space conference everyone is equal and all ideas have an opportunity to be discussed, in real life, face to face with other humans. Participants of the open space create the agenda first thing in the morning. People are given the opportunity at this time to announce their session to the entire group. Sessions can be added any time during the open space, but the morning is the only time people are able to announce the session to the entire Open Space. After announcing the sessions, participants hang them on the Open Space "Marketplace." The marketplace is the agenda and schedule. Once the session announcements are over, the Open Space begins. Participants then choose which sessions they would like to attend. Open Space Technology has five "principles" and one "law." The five principles are: Whoever comes are the right people. Whenever it starts is the right time. Wherever it happens is the right place. Whatever happens is the only thing that could have happened. And when it's over, it's over. The one "law" is the law of two feet: if at any point during our time together you find yourself neither learning from nor contributing to the discussion, use your two feet and go someplace else. At the end of the day, participants come back together to share moments of the day. A small corner of the Open Space room is reserved for ancestral skills. This is a place to share, teach, and practice natural hand crafts. 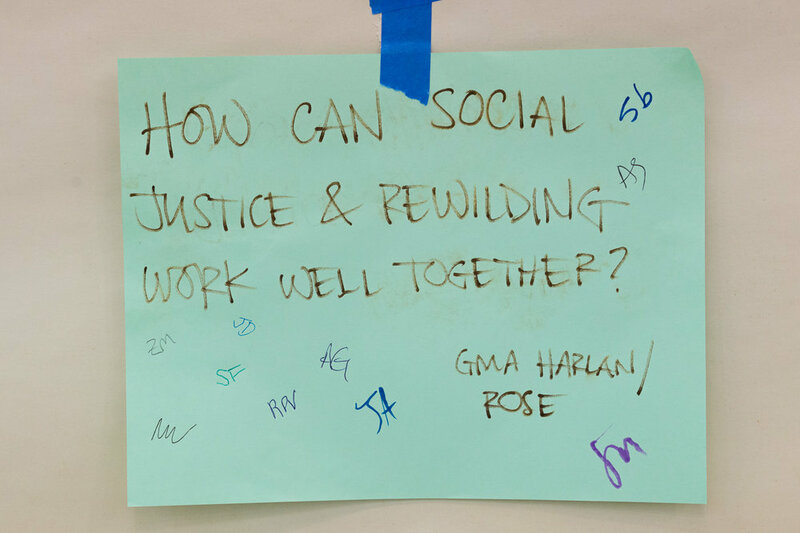 While dialogue and conversation are the central themes of this conference, not ancestral skills (check out our summer gathering Echoes in Time for a focused week of skills building), we offer this space as a way of grounding our dialogue through handwork. Come relax and work on a project, share something you are working on, or teach a mini skills session. Diana Larsen is coauthor of Liftoff: Launching Agile Teams and Projects; Agile Retrospectives: Making Good Teams Great; and Quickstart Guide to the Five Rules for Accelerated Learning; as well as co-originator of the Agile Fluency™ Model. Diana delivers inspiring conference keynote talks and facilitates productive Open Space Technology events. As a volunteer, she contributes as a leader with Agile Alliance, Organization Design Forum, Agile Open Northwest, and the Agile Open Initiative. As a founding partner of FutureWorks Consulting, she leads the practice area for Agile software development, team leadership, and Agile transitions. FutureWorks Consulting contributes to the growth of workplaces where people say, “I love my work; this is the best job ever!” As a founding member of the Agile Fluency Project, Diana delivers ways to chart a course for teams, create alignment with management, and secure organizational support for continuous learning and improvement. This year we are introducing Field Classes as a part of the conference. The theme of these classes is “Agents of Regeneration.” How can humans create regenerative systems across a wide range of places, from home scale to private property to public land? We will offer a variety of planting and restoration programs within the St. Johns neighborhood. Childcare is available for children ages 5–11. The fee for childcare is $95. This covers the Saturday and Sunday portion of the conference only. To register for childcare, please see our registration page. This event is hosted by Rewild Portland, a 501(c)(3) nonprofit organization. We do not have investors who make money from this event. Any money earned goes back into our mission to create cultural and environmental resilience through the education of earth-based arts, traditions, and technologies. Click here to learn more about our organization and our values.